Beatiful on the outside but powerful under the hood. The patch hardware may appear simple and sleek but comes packed user user functionality. The PATCH System comes equipped with 4 Connectors housed in the front panel of the system. 2 - Inputs (XLR/TRS Combo jacks) and 2 - XLR Output jacks. These front panel connectors allow a user quickly & easily integrate outside audio equipment or instruments into your recording setup. 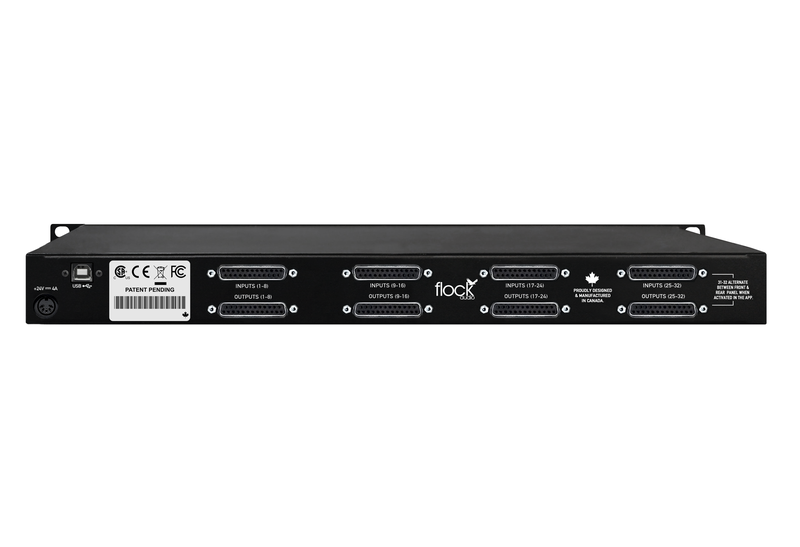 The front panel connection points are optional use and can be activated/deactivated via using the Flock Audio PATCH APP. 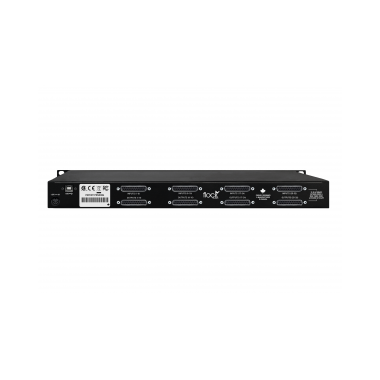 The 2 - Inputs (XLR/TRS) are also capable of powering 48v microphones. USB-A to USB-B Control - The PATCH System uses very little CPU processing power to send and receive commands from the hardware. Because of the minimal amount of processing required, the PATCH System works off a USB 2.0 and on-wards compatibility. The design was chosen for a low CPU usage so you can have your system processing working harder for your Interface & DAW rather then devoting a large amount of that processing to routing your analog audio equipment. DB25 Rear Connections - DB-25's/D-Subs create a clean, simple and organized form of connections to the rear chassis of PATCH. Utilizing the standard Tascam Wiring Pinout schematic, any DB-25/D-Sub cable following this wiring format will work seamlessly with your system. For additional flexibility we've added the feature that Inputs & Outputs (31 - 32) will flip from the rear side of the chassis to the front when activated in the PATCH APP. 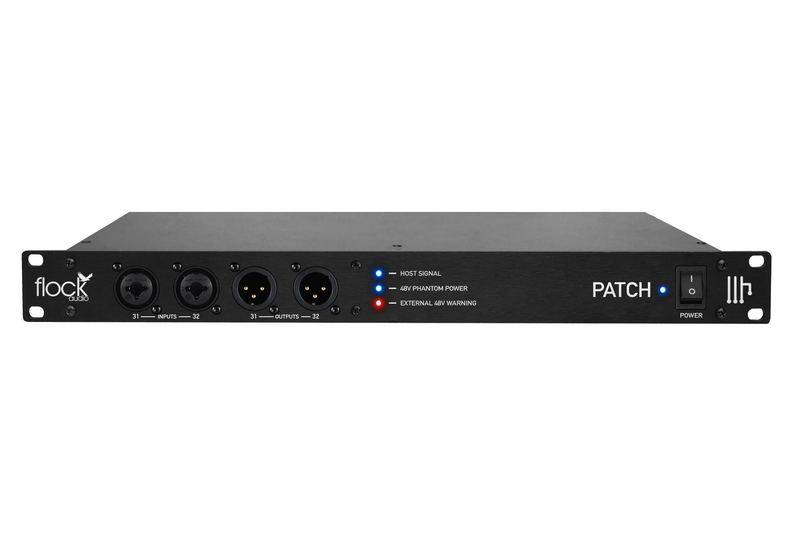 This allows a user to quickly audition other outside audio equipment without disconnecting any already designated hardware connected to the PATCH System. 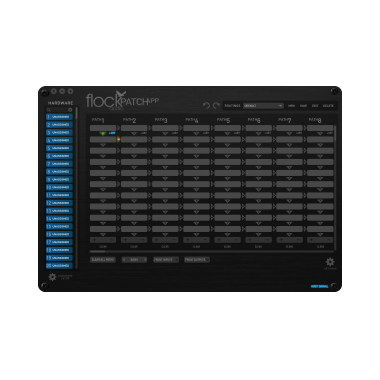 Wondering if its possible to integrate a Flock Audio PATCH System into your already existing traditional patch bay setup? Of course it is! 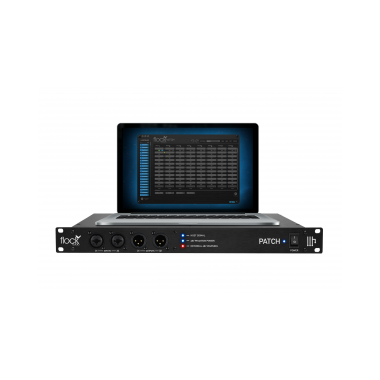 PATCH's flexible design allows users to configure it into any existing setup and utilize its incredibly versatile and intuitive functionality into your studio! We take no prisoners, only friends! 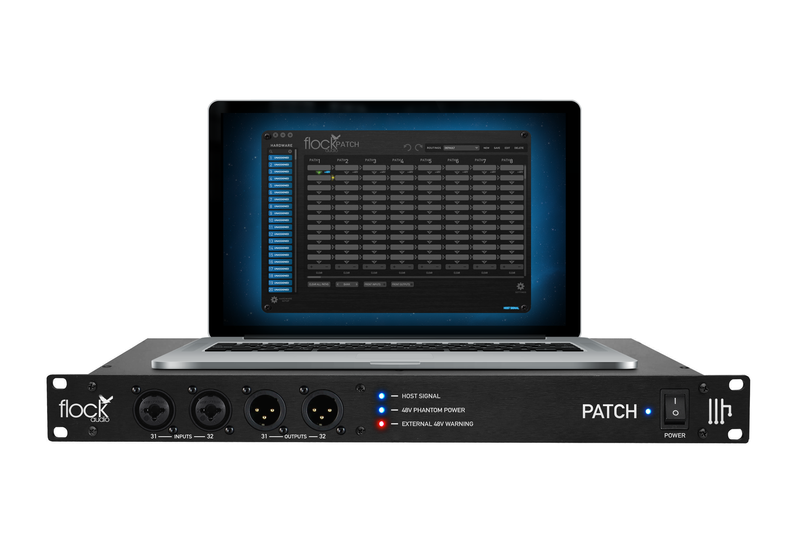 We developed PATCH to be a powerful tool allowing you to use & route your analog hardware with ease... However, we can't make any promises that you won't fall in love with PATCH and wonder how you ever lived without it in your workflow. Store all of your outboard hardware for easy drag & drop functionality in the "Hardware Index". The PATCH APP allows a user to customize and store all of their outboard audio equipment into an easy to use searchable Index. Create, Store & Recall various routing configurations in seconds. The PATCH APP Routings Menu allow users to quickly Store active routings and recall them at a later date. The Routings Menu even has the ability to open the external storage folder right from the application so you can move Stored Routings to DAW session folders for better organization. Quickly bank through 32 available Paths (8 per bank), Add additional digital rack spaces for more processing then 10 default spaces, clear single or all active paths for new routing opportunities and engage the front Inputs & Outputs right from the PATCH APP. This bottom section of the app allows the user to control important parameters of the PATCH System while on the fly. The Active Routings section of the PATCH APP is where a user can setup and visually see their active routings. Using the simplicity of Drag & Drop functionality, a user can click and drag any piece of analog hardware from the Hardware Index into a Path to create their desired signal flow combination. Designed on the visual concept of most DAW layouts the PATCH APP Activate Routings section immediately becomes a familiar sight soon as user begins clicking around the in the app. Advanced Multing? Absolutely. The PATCH System users can simply click the directional arrow so it illuminates "Yellow" to the right side of any active path on the specific digital rack piece they prefer multing from. What about impedance load issues that come with traditional multing? Forget about it... Using PATCH's advanced multing capabilities any signal Multed off the original source is unaltered and has no load issues. Mult to your hearts content without any guilt of split signal quality loss. 32 Channels of 48V Phantom Power built right on board. Users can activate 48V power to any of the available 32 Input channels for powering your favourite condenser microphones. Why 48V on board? 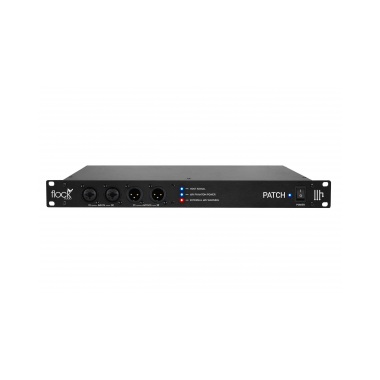 Well because through various testing phases with traditional patch bay options, majority of patch bays were either not able to carry phantom power at all or significantly under powering microphones. So we decided to take it one step further and build 48V right into the system. Now you can power your condenser microphones the way they were intended to be powered and get the most out of your other investments. Routing and indentifying multiple PATCH Systems for expanded I/O capabilities is easy. Simply setup designated Sends &/or Passes with your corresponding analog connections in the rear of the chassis between the PATCH Systems and move analog signals freely between units. Each PATCH System is identified by the coloured outline you choose. In the example to the right, we have 3 PATCH Systems based upon the coloured outlines (Blue, Red & Teal). We have the Microphone & PreAmp connected to the Blue PATCH System, the Compressor & Tape Simulator connected to the Red PATCH System and finally the interface connected to the Teal PATCH System. In-between these analog hardware pieces in the active signal path flow you'll see Send Passes. These Passes allow you to move your analog signal from one system to the next to get your preferred signal processing depending on your connected configuration. Time constants are dependant on ratio. 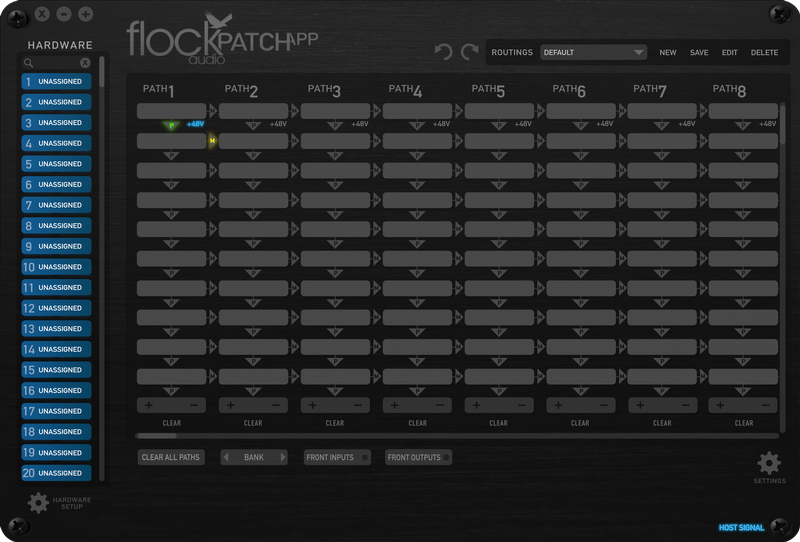 The Flock Audio PATCH System is designed, developed and professionally manufacturered in North America (Edmonton, Alberta, Canada). The PATCH System is also RoHS complaint.